If you buy a vintage car, you are aware, or it will very quickly become apparent, that what you’ve bought takes a great deal more looking after than a new model straight out of the workshop. Time will have taken its toll on bodywork, electrics, engine and pretty much every aspect that makes a car, a car. Some things are built to last and some are built to be enjoyed for a time and then replaced. The Deepsea Sea-Dweller 116660 is a watch made to go to unimaginable depths. There’s a reason the vintage Rolex market is so strong. The build quality and longevity of their watches, from the very earliest days, has been paramount in the minds of engineers and designers. They have been steadfast in their mission to build pieces that are as resilient as it is conceivable for a watch to be. It is slightly counterintuitive for a maker of luxury goods to create a product so strong and so well that it will last their customers, and their customers’ descendants, a lifetime. The chances are if you buy a Rolex, you will only need to buy one. Their modern sports watches, in particular, are renowned for their solidity—their ability to weather the harsh beatings that often come with everyday wear. They use the toughest steel on cases and bracelets, their bezels are forged from practically unbreakable ceramic and they have movements with an inherent strength, not only from their physical size, but also from components made from revolutionary materials that resist shocks and laugh off magnetism. 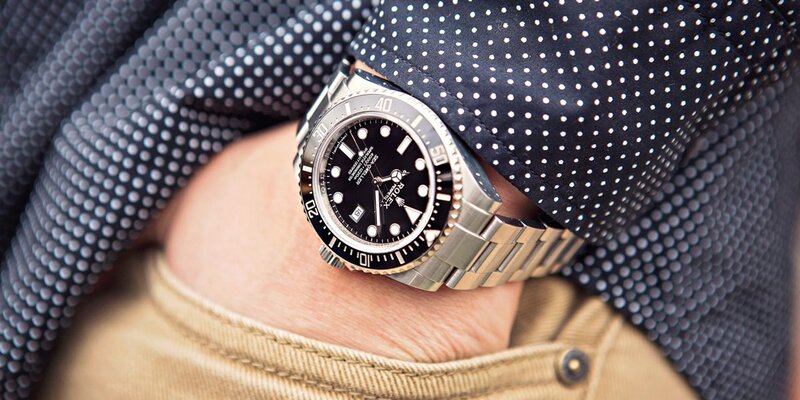 A Rolex, famously, can survive almost anything. Every now and then however, even the most celebrated watchmaker in the world feels like beating its chest and flexing its muscles. Rolex started their water-resistant watches with Mercedes Glietz who swam the English river. 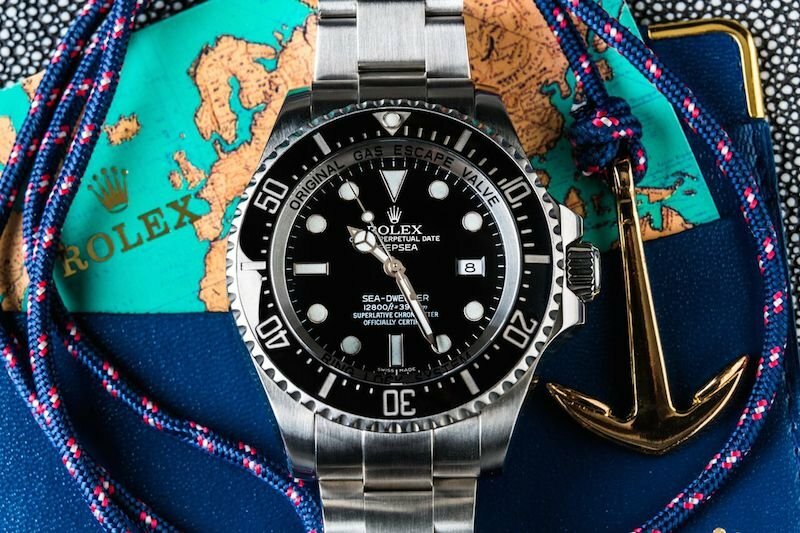 In 2008, Rolex introduced the Deepsea, the culmination of the brand’s long relationship with the planet’s underwater pioneers and a dive watch that rewrote the rulebook on what could be achieved. With a waterproof rating so immense it leaves even the Sea-Dweller in the relative shallows, and absolutely kicks sand in the face of the Submariner, the Deepsea is more an exercise in what is possible rather than a watch whose prodigious capabilities would ever be fully used. Sealed tight to a depth of 12,800ft, it could accompany the foolhardy on a trip to visit the Titanic’s final resting place and come up smiling. While still very clearly from the same genetic code as its submersible stable mates, the Deepsea is a different animal altogether. The Rolex Deepsea Sea-Dweller ref. 116660 can be used even in the toughest of circumstances. Creating a watch that can survive the crushing pressures that exist more than two miles underwater can, of course, be achieved by simply building a case of ludicrously thick proportions. But that kind of blunt instrument engineering has never been the Rolex way. Taking the easy route to a watch that can withstand forces of around 5,500lbs per square inch would have left us with an unwieldy eyesore, a curiosity notable for its party piece and little else. 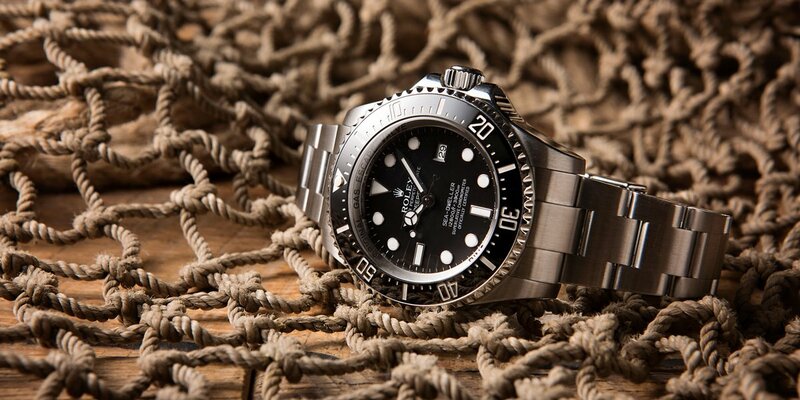 Instead, Rolex have steroid-infused their already highly capable dive watches, keeping their basic DNA but outfitting them with the sort of breakthrough technology that allows the Deepsea to retain at least a semblance of normality. That being said, this is not a small watch. With a diameter of 44mm, 48mm when you include the oversize crown, it stands some 17.7mm high. The sapphire crystal alone measures 5.5mm, the thickness of some dress watches. Whereas the Sub, and even the Sea-Dweller, could be fitted under a dress shirt should occasion demand, the Deepsea attends very few black tie galas. Its natural habitat is underwater. Deep underwater. Far deeper, in fact, than a human, or even a nuclear submarine, can venture. So, how does it do it? How far down would you really dive with this Sea-Dweller? The key is what Rolex have dubbed their Ringlock System. Consisting of three principal elements, the backbone of the structure is a central ring formed from a nitrogen-alloyed steel called BioDur 108. Normally used for surgical implants, it is three times stronger even than the 904L Rolex uses in its case construction, which is itself the toughest metal employed by any watch manufacturer. This steel loop soaks up most of the five tons of stress pushing down on that ultra thick crystal, spreading it around its circumference and onto the two-part case back. The grade 5 TA6V titanium alloy back is engineered to flex under pressure, absorbing the incredible forces and safeguarding the watch’s integrity. It is a system many years, and millions of Euros, in the making and one that allows the Deepsea to be 10 percent slimmer than a watch with its staggering capabilities should be. Its mix of engineering excellence and never-before-used alloys adds up to a grandstanding technical achievement, a watch built with no compromise for professionals in one of the most hazardous occupations on earth. Deep saturation divers spend extended periods of time underwater breathing enriched gas mixtures at bone-crushing depths. At the end of each tour, they face long decompression stops to allow the gases that have been absorbed by their bodies to slowly dissipate, reducing the chance of decompression sickness, otherwise known as the bends. The main culprit is Helium, the smallest gas particles found in nature, which not only flood divers’ bloodstreams, but also work their way into their watches, forcing out the protective dial crystals as they ascend. Rolex addressed the problem in the 60s, collaborating with French industrial diving specialists Comex to come up with the automatic Helium Escape Valve (HEV), a small, pressure sensitive regulator that releases the gas from the watch’s interior as divers return to the surface. First seen on the Sea-Dweller, it plays a vital function on the Deepsea, acting as the watch’s own mini decompression chamber. 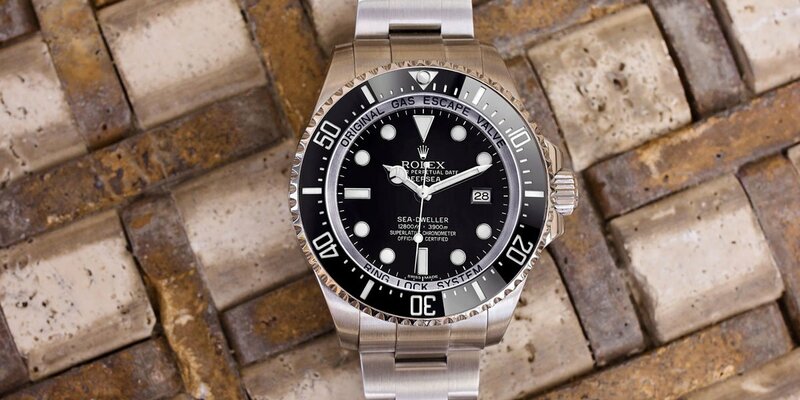 In addition, it shares some of the same innovations that put Rolex’s dive models on the map in the first place. The engraved bezel is made from the brand’s own Cerachrom, an almost indestructible ceramic that resists seawater corrosion. It, unlike the Yacht-Master’s surround, only rotates in one direction, letting wearer’s keep track of their immersion time. And the incredibly tough Oyster bracelet comes with both the vault-like Oysterlock clasp and the ingenious Glidelock system that allows fine adjustments to be made easily, without the need for tools. What do you think of the Deepsea Sea-Dweller 116660? Comment your thoughts below. Here at Bob’s we have a selection of Deepsea examples. The ref. 116660 has only ever been made, you won’t be surprised to learn, in steel. There are no gold versions of a watch designed to work faultlessly nearly 4000M underwater, for obvious reasons. 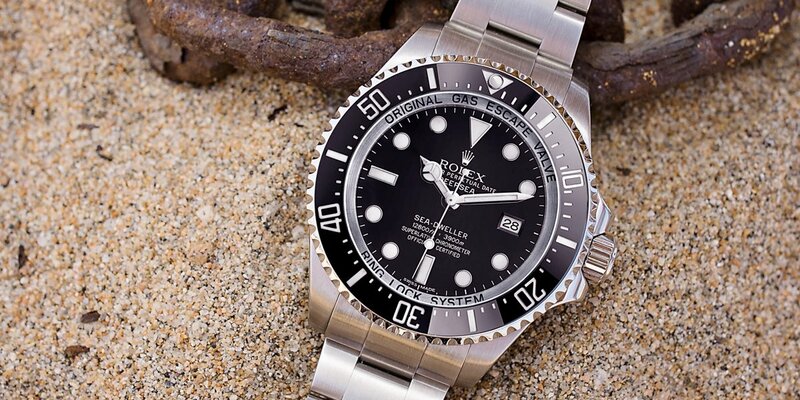 Adding to its utilitarian appeal, Rolex have only released black dial versions, and it is now the only one of their three dive watches to have no Cyclops lens over its date window. It gives a pleasing symmetry to the look of the Deepsea that many fans feel has been lost now the Sea-Dweller’s latest incarnation has its date magnified. Inside, the Cal. 3135 provides the drive, a caliber with a thirty-year pedigree that is still one of the most accurate and reliable ever made, by any manufacturer. It has been giving exemplary service since 1988, in some of the most testing environments imaginable. What the Deepsea lacks in the Submariner’s versatility, it makes up for in sheer presence. Although a 44mm case is no longer considered especially outsized, the heft and bulk of the watch give it an aura all its own. While it may have capabilities far beyond what its owners can utilize, there is nothing to touch it as an example of watchmaking virtuosity.